I have an Etsy account, but It’s not set up to sell things… the downfall there is that you have to list items in $ dollars. I also opened up a Folksy account, but for some strange reason, I can’t for the life of me uploads any pictures. So there we have it… thanks to Emma, I have now listed a card on Ebay… which card? DCWV Rock Stack – used one of the sheets out of this as my base card Black card with silver skull and crossbone design. I’ve had a busy old evening! After we had got tea out of the way, I had to give up my laptop to my son to allow him to complete his project/homework on WWII. 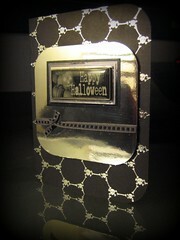 He was on a tight schedule because I needed it back as I had an order to make 4 cards. Whilst he was doing that I took myself out to the greenhouse to plant some more seeds and do a bit of tidying and re-organising. I managed to get a row of raddish seeds in the 3rd bed. Sowed more Broad Beans, Peas, Cucumber, & Lettuce. I have no seed potatoes, onion or shallot sets in yet, still have to buy them, i’ve been so busy and so disorganised!. So I will have a scout around online and see what I can get.